A state high court sitting in Birnin Kebbi has sentenced to death one Usman Aliyu, who carelessly knocked down Road Marshal Assistant (RMA III) Muhammad Babangida, a personnel of the Federal Road Safety Corps to death. A statement by the Corps Public Education Officer, Bisi Kazeem, on Friday in Abuja, noted that Babangida was serving in Kebbi Sector Command. He said the incident occurred along Ahmadu Bello way in the state Capital, Birnin Kebbi on April 3, 2017, while the officer was reportedly performing his statutory responsibilities. Kazeem said that Aliyu, who was given a death sentence on Wednesday, was also reported to have absconded after knocking down his victim to death. However, the convict was arrested along Kalgo road by men of the Nigeria Police Force after an intelligence tip off. He said that from available reports Usman Aliyu drove a Black Toyota Corolla saloon car with registration number, KLG 342 AA on the said day and initially attempted to knock down Marshal Inspector (III) Abubakar Garba Abubakar of the same patrol team and the deceased. “Noticing he couldn’t knock Garba down, he recklessly headed for the deceased and ensured that he knocked him to death as his first target, Inspector Garba narrowly escaped the hit,” he said. 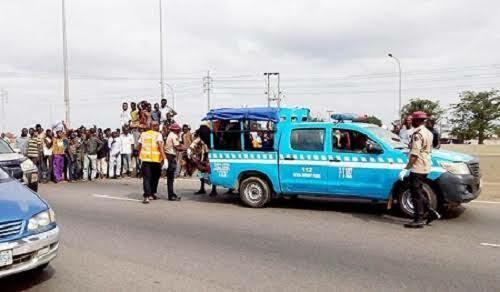 NAN reports that the Corps Marshal, Dr Boboye Oyeyemi had earlier reacted to the incessant killing of FRSC personnel and had lamented that the Corps had lost 74 personnel in the country to reckless drivers in the last 18months. According to Oyeyemi, the Corps will not stop at ensuring the prosecution of those erring drivers. “It is my responsibility to ensure the safety of my personnel on the highway, so if you knock my personnel and you are running away, I will go after you,” he said. Oyeyemi, therefore, warned drivers to desist from such unlawful and inhuman act and always ensure that they were operating within the ambit of the law.